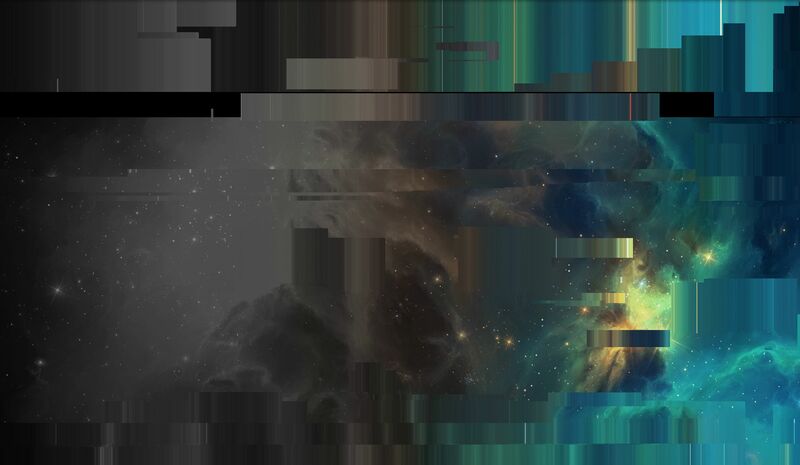 Welcome to the Glitch Index! The Glitch Index is a guide detailing about all of the various types of glitch pets in Neopia. This is not a directory or UFT/UFA pet list: this page is simply meant to be an informative reference for some of the least known pets on the site. As I am a PCer, I will also touch upon the sticky business of trading glitch pets. Disclaimer: This is NOT a guide on how to create glitch pets. This is a purely informative site detailing on what they are and where they came from. Also, if you see anything incorrect, please feel free to let me know, as quite a few assumptions were made in the process of filling this guide. I would very much appreciate any help/corrections you may be able to provide! Feel free to neomail me if you have any questions or comments! Glitch pets are Neopets that are revealed to have some sort of "permanent" characteristic that is normally not attainable, or currently no longer attainable. Each of these characteristics were not meant to be able to be applied to the pet, and is due to some flaw in code or program that allowed it to occur. Many of these glitch pets are very old, as coding on the site are now checked much more often, drastically lowering the chance of another glitch pet "species" arising. However, since none of these pets were "predicted" to come about, there is always a chance that new glitch pet types may still arise in the future. Glitches, to me, are a really interesting thing. Generally a glitch refers to something that is not meant to be, something that arose due to a flaw in coding or human error. Some people tend to think of glitches in a very negative light: they're harmful and can mess things up permanently. Most of the case, as shown throughout this guide, this is not true. These glitch pets arose, yes, due to some flaw in code as the site was developing and growing up, but they are just a small, harmless reminder that, well, the site is growing. The programmers here are human, and they make mistakes, yet the site is still here, and so are these pets (at least, for now). When the site was young, there were probably many glitches. Only a very small number of pets were affected permanently to survive the various purges and bug fixes to stand as the glitch pets we see today. Occasionally it's not the pet itself, but the petpet that makes it stand out. I became interested in glitches when I was reading about glitch Pokémon in the first generation games, the most famous being Missingno. When I learned about the glitch pets on here, I really wanted to learn more about them. To those that are curious about them, I hope this guide becomes helpful! You may navigate through the different sections detailing on the specific "types" of glitch pets that are categorized in this guide. You may also click and scroll down on the hover text to read a brief description of that pet. STABLE - This pet is safe to trade and advertise. Special transfer requirements may apply. VOLATILE - This pet can be advertised and traded, however, TNT has detailed in Editorials that they have intentions on fixing this specific type of glitch pet, and your glitch pet may not remain in its current state forever and can be fixed at any time without notice (however, your pet will not be deleted). UNKNOWN - This pet cannot be advertised for its specific glitch pet characteristic. In addition, TNT has not mentioned if they intend to fix these pets or not. NOT YET RECOGNIZED - TNT has not recognized this type of glitch pet and has not stated intentions on fixing or deleting. For the time being you may assume these pets as volatile. Drag images to your URL bar! Many images are sized down in order to preserve flow. Click and drag the image into your URL bar to view in full size. In addition, quotes added by other users are separated by grey boxes. There are also individual glitch pets that do not fall into any of these categories, but display some sort of glitch that has persisted through time. 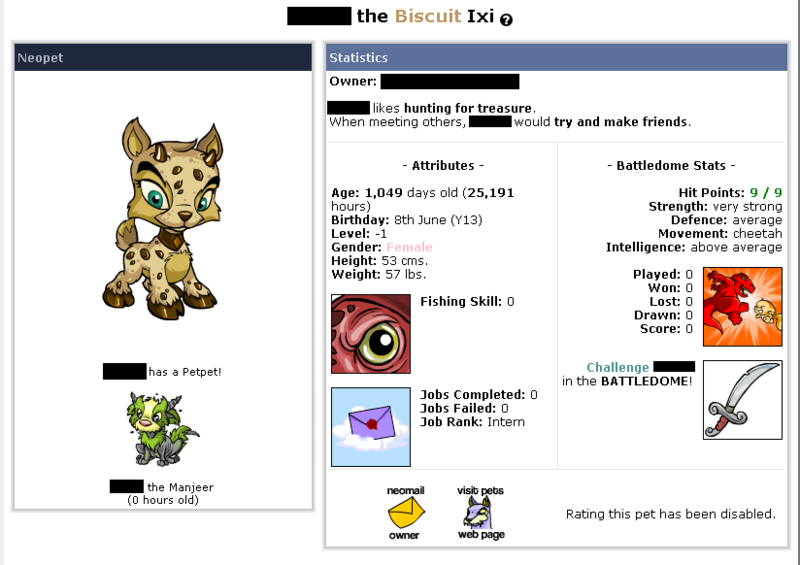 A glitch that seems to happen often is that a pet's customization does not match the color displayed on its petlookup, or the .png image of the pet does not match the Flash image of the Neopet. I do not have a specific explanation for this occurrence but I can only hypothesize that is probably just due to lag in the customization servers, similar to how a Magma pet will show up as Red everywhere except the Flash customization, where it will still show as Magma. Since these pets seem very unstable, I have decided not to put them in this guide (but if I happen to find enough evidence that this type of glitch tends to persist, I may reconsider). Quite often TNT can mess up and pets will show up with either strange eyes, hair, or mouths that do not match their color or gender. While these are probably a form of display glitch, this sort of glitch happens too often and unpredictably to describe. Below is a list of glitch pets that are special cases and, due to the fact that they're often the only pet of its kind, have no real explanation for their occurrence. I realize this is not a specific case, but a set of cases, but it was asked about several times so I may add a specific section for this in the future, if the list gets sufficiently bigger. This subset of pets have a real color and real species assigned, but the specific combination was not available for that species at the time (or ever). For the most part, they cannot be customized in any way, since customization crashes and fails to load the pet. While this originally mostly only applied to Magma Vandagyres, the 2018 Charity Corner granted a Limited Edition perk that changed a pet into an LE species. The script did not check to see if the resulting color/species combo was valid, and in addition, further glitched to transforming the color into something it was not originally, including Chia-only fruit/veggie colors. Notable known examples include a Lemon Lutari, Aubergine Hissi, Chokato Cybunny, unknown Lutari, and Darigan Lutari (notably, the only one of these with an actual working customization). 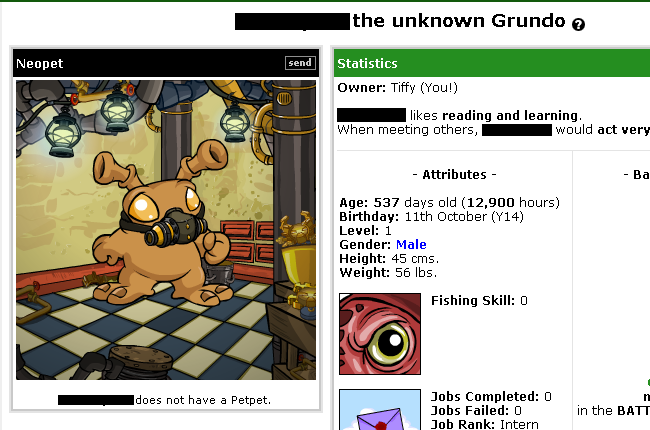 Although I originally nominated this pet for the title of strangest glitch pet, it has since been frozen, although I had a bit of a screenshot showing what the petlookup originally looked like. I did check, and there wasn't any user-edited coding with the exception of the bit of text. 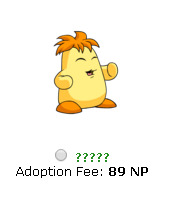 If you check the actual customization by name, it is actually just a blank customization, but the Flash customization on the petlookup showed a customized MSP Poogle. Just like %20, I really can't think of any explanation for this pet, which lacks a species but lists two colors instead, with Red being the only one that is colored. Judging by the height and weight, he seems to identify closest to a Gelert. This pet was born more recently than a lot of the other glitch pets as well.. although it seems that there has been another of its kind before, though not quite exactly the same case. All the information below was provided by Kathy. Two of the pets are grouped on the same account and are slightly different from each other, but I will still address all three of them separately. First we have ****. He's the only one I can really link to, because he's actually an existent pet, even though he doesn't show up on the userlookup. Her speculation is that he was simply born with this name, and I would categorize him under an invalid character pet. Next we have ####. His petlookup and petpage link to a non-existent pet error. However, if you initiate a transfer to the account, the pet actually shows up as a Green Kacheek, alongside ****. A third pet, ???? ?, was found with the same case as #### - non-existent pet lookup and petpage, but shows up on the transfer page. Kathy speculates that #### and ????? became non-existent due to a site-wide glitch during the site migration to Jumpstart in early 2015, when symbols all around the site (such as in Neosignatures and lookups) were replaced with question marks. After reverting, these pets may have been messed up to the point that they're in this strange existence state. Spooky! Unfortunately when I found Mozzqito, the current owner had recently traded for him and had no idea how the glitch came to be. This looks like a typical case of an over-aged petpet except the age is far beyond the age of the site (it even outdates the internet). 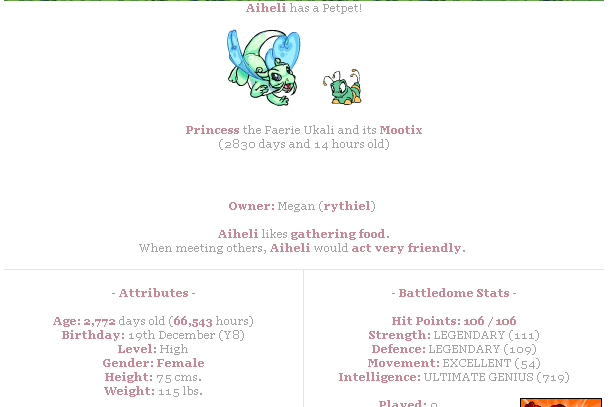 I was also informed of another pet that has a different petpet with the same age as Mozzqito's petpet. Both of these pets have similar ages (within 48 hours) so that may be a hint as to what happened to show this false value. Blitzern is a one-of-a-kind "PeoCog", previously a Peophin without any color designation! Although he was eventually "labeled" as Tyrannian by TNT, his customization still doesn't load and, like the invalid color/species pets, is completely uncustomizable. More details and FAQ can be found on his petpage! Lynyrd the Blue Tuskanninny was found by Casey during the last purge. Although the pet lookup looks quite normal in every regard, visiting Lynyrd's owner leads to what seems to be a non-existent account. Not a frozen one, nor a disabled one, but one that has not been created (however, the username seems to be unavailable for creation). The most likely explanation seems to be that the account purged, but the pet did not, leaving Lynyrd in a strange state of limbo. Another pet, a Grarrl, was also reported to be in the same state. Okay, so this has been running through my mind for quite some time now. 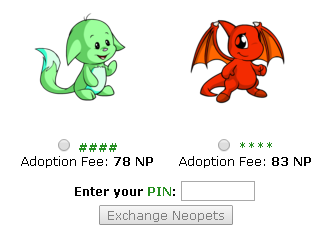 I've noticed a lot of people trading their Draiks / Krawks, or expensively painted Neopets for basic "glitched" Neopets (Neopets with no eyes, etc.). 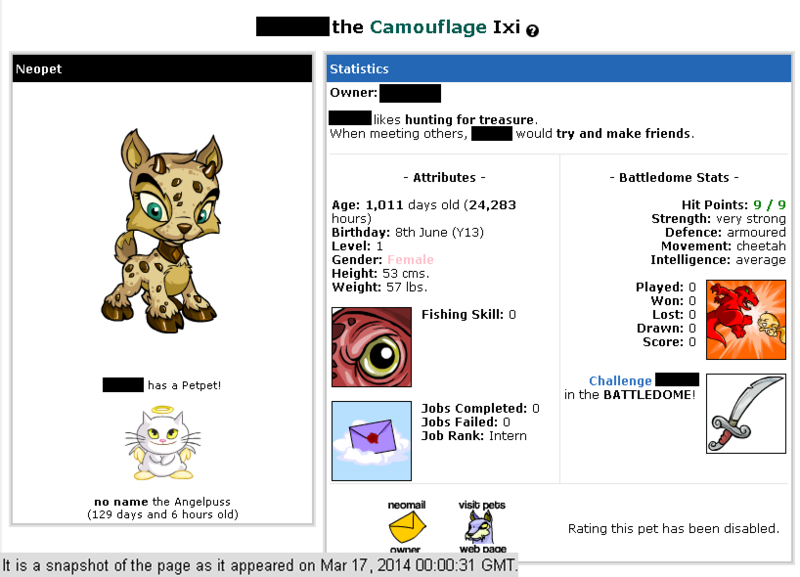 Why they feel the need to have a glitched Neopet is beyond me. Now, this is all fine and dandy, sure. Trade with whatever Neopet you want, but... won't you guys, oh wondrous TNT, eventually "fix" those aforementioned glitched Neopets? Zomg, I got into the Editorial! Anyway, for my question, which is about trading Neopets: as you may know, there are some people who trade Neopets that are considered to have great value for glitched ones. I was wondering: what would happen if two people agreed to trade, let's say, a royal Neopet for a glitched one, but the glitched Neopet then unglitched during the trade? Can the owner of the glitched Neopet be held responsible for that? I was wondering since I had a glitched Neopet, but it then unglitched before I could try to trade it. As the name suggests, negative–statted pets are born with negative battledome-related stats, which includes strength, defence, health (HP), and movement. They start out with the standard 'average' intelligence and the normal minimum level of 1, however. If they get healed "to full health" by the Healing Springs, they simply return to -1 health. Although it was widely believed that they could not drop their stats (including health) any lower, one exception was found to have -2 health due to a random event. This may mean that even at negative stats the pet may still lose stats, although this is very rare. 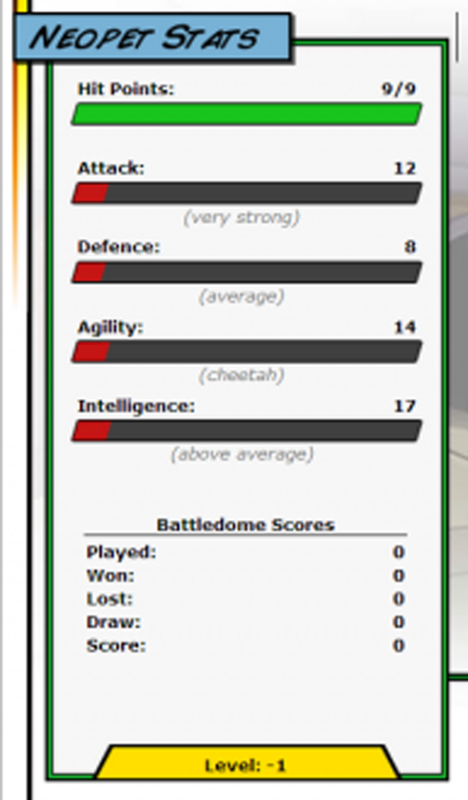 Because their health is not a positive integer, the current Battledome views it as having equivalent to no health, which means that you will be given the error message "This Neopet has no hit points and cannot fight". In the old Battledome, it was reported that you could actually enter battles with them, but you would lose immediately (creating a very comical situation against Punchbag Bob). The rest of the stats act identically to having any other positive stat below 8, which means that attacks will receive a standard .5 boost. More information on boosts can be found here. They are born with a 0 cm. height and 0 lbs. weight. The weight can be modified by certain methods, however. In every other instance, they act just like any other pet. They will receive stat gains normally and any single stat point boost will simply put them at 0, which will act identically to a -1 stat. The Lab Ray will refuse to drop them any lower, just like how the lab ray will not drop the pet any lower than a minimum positive value for any given stat. Negative-statted pets were found to have been a result of a specific method in the old pet creation system, which explains why almost all known negative-statted pets were born before early April 2008 (which was when the Create-a-Pet was revamped to the current one-page system we have now). Because they were not widely known about at the time, only a limited number were created in the vast timespan that they were theoretically creatable (the age difference of most known negative-statted pets span over 1,000 days - exceptions detailed below). However, since they are so old, a very small number of UC negative statted pets do exist (I personally only know of one). They were the result of interrupting the last step of the creation process when the pet was being created, assumed to be when the stats, height, and weight were generated. They came from hitting return quickly after creating a pet, not the lab. The pet's stats wouldn't register and they'd be born with -1/-1 stats as a well as 0 height and weight. Source: I made a ton of them back in the day. LOL. However, because of the not yet born glitch -- where a user, utilizing the multi-step creation system, would stop in the middle of creating a pet -- even younger negative-statted pets than the ones made during the old creation system (that is to say, ones that are younger than the create-a-pet revamp) have been found due to this glitch. I've actually seen glitched-stat pets made way later than 2008! They were stuck in the not-yet-born stage for a looooong time, and their owner didn't come back to create them for years. I've seen a lot of people trading glitched Neopets. 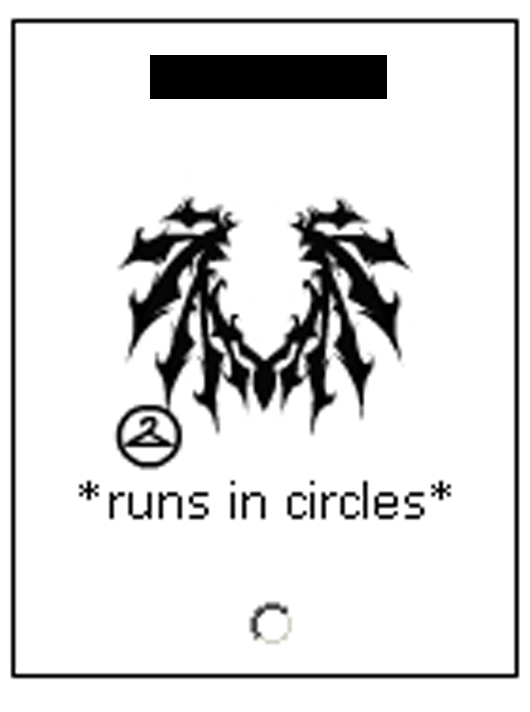 You know, Neopets with eyes missing, mouths that disappear, and some with zero or negative stats. However, when I made a topic asking if anyone would trade for my glitched stat Neopet, someone told me that I could be frozen for profiting from a glitch. So, is trading glitched Neopets something we shouldn't be doing? As you probably know, there are a small number of Neopets that have negative stats and 0 height and 0 weight, which came from a glitch in the old Neopet creation system. In a previous Editorial you mentioned that glitch 'pets were okay to trade as long as the receiver is aware the Neopet may be fixed (that was in reference to the unknown Grundos). I would like to know what your official stance is on negative-statted Neopets; they've been around for years, but they offer no advantage to anything (you can't go into the Battledome with them), so they are essentially harmless. Will you be keeping these unique 'pets as they are for the foreseeable future? 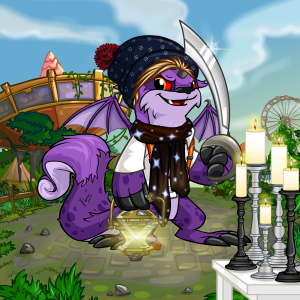 I really love my negative-statted Neopet. Unknown Grundos (currently) attribute their uniqueness to one factor only: their color shows up as unknown in place of their usual color on their petlookup ONLY. All unknown Grundos were born on October 11th, 2012. 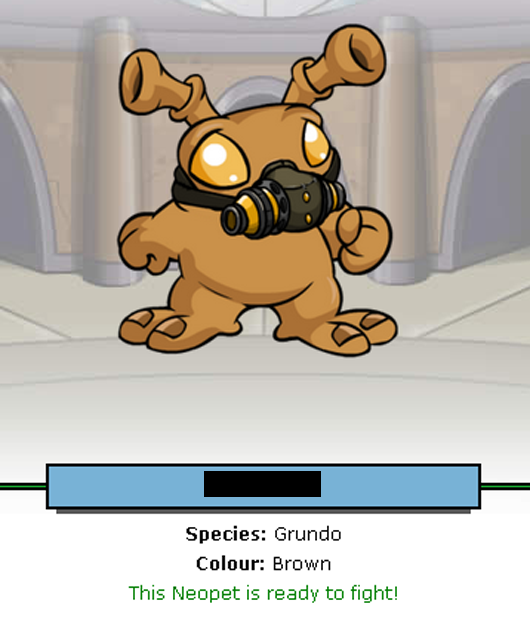 In every other location where the color of the Grundo is displayed, such as the quick ref or the pound, the "correct" color of the Grundo (what the customization reveals) is displayed instead. Painting over the Grundo will replace the unknown tag with the correct painted color. Transferring or pounding the Grundo will not fix the glitch (as of November 2015). It seems as though the tag used to be fixed upon transfer, but it is proven that it is no longer the case, at least for the time being. However, a very interesting side-effect took place upon the successful creation of an unknown Grundo: a copy of all Grundo paint brush clothing sets would appear in your closet, despite not actually having the corresponding colored Grundo. You could acquire multiple sets upon multiple successful creations of unknown Grundos. However, the clothes will not transfer with the Grundo as it is still treated as a basic Grundo. All unknown Grundos were born in a small timespan lasting a few hours during the 2012 purge, during the morning of October 11th, when the creation of any standard Grundo at the Adopt-a-Grundo page would lead to an unknown Grundo. Negative/zero level pets are just like normal pets in every way except for one aspect: their levels are below positive values, as their name suggests. Negative-statted pets must be born that way, and they must be created a specific way to become negative-statted. On the other hand, ANY pet has the potential to become a negative-level pet (for now). Yes, ANY pet, including UCs and other glitch pets, such as negative-statted pets (so yes, it is theoretically possible to have a negative-statted negative-level pet, although unlikely). In addition, there are two ways that a pet could (currently/more recently) reach this status, and a third way that was part of the old site. Their height and weight are displayed correctly, and all other stats are normal, positive values, unlike negative-statted pets, who have 0 height and 0 weight and (typically) have negative-value stats. However, negative statted pets are born at level 1 like any other pet. This non-positive value is actually a true value: in the Battledome, the negative/zero level pet would not be able to learn any of the first tier of Faerie Abilities due to the fact that the Battledome does not recognize it as an adequate value at or above level 1. With the random event revamp in April 2014, two things took place: the Random Events of Neopia were updated (a few were deleted, and more importantly for this guide, a few new ones were introduced) and The Coincidence, after its event, became a daily. Both of these are linked to the negative/zero level pets. With the coincidence, one of the outcomes was that your active pet would lose levels, up to 3, according to Jellyneo. 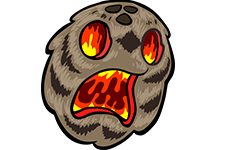 In addition, two brand-new Random events were introduced: one that described your active pet complaining about having not trained for a while and feeling weak, and one that would decrease your active pet's current level by one by getting hit by an evil looking-coconut on the head. It seems like there was a coding oversight that allowed any of these effects to take place even when the pet is level 1, and thus the level naturally still become subtracted by 1 and becomes 0. Below are two screenshots: the one on the left was taken at the time I talked with the current owner, the other was a cache while the pet was with a previous owner. It seems as though the Coincidence result and the REs could occur even when the pet is level 0, which means a negative-level pet is possible. The coding does not differentiate between -1 and -2 and so on, so level -2 pets are possible, and so on. As I recently found out, the Lab Ray also did not do the positive integer result check a long time ago, which allowed Lab Ray zaps to also deduct to a negative/zero value similarly to the two methods above, although this was presumably fixed quickly. In any case, this "method" was a relic from ages ago and probably almost all negative/zero pets came from the more recent events. TNT has not officially recognized these pets and thus there are currently no editorials related to this. It is unknown if there has been a fix yet, but I have personally witnessed quite a few in this category, and they are still in their glitched state. Until proved otherwise, at the latest update of the guide, it seems that pets are still able to become negative level. A pet with a space or non-letter/number/underscore character in the name is special because these characters are not usually allowed to be entered in a pet name. The create-a-pet page would deny the name due to invalid characters. 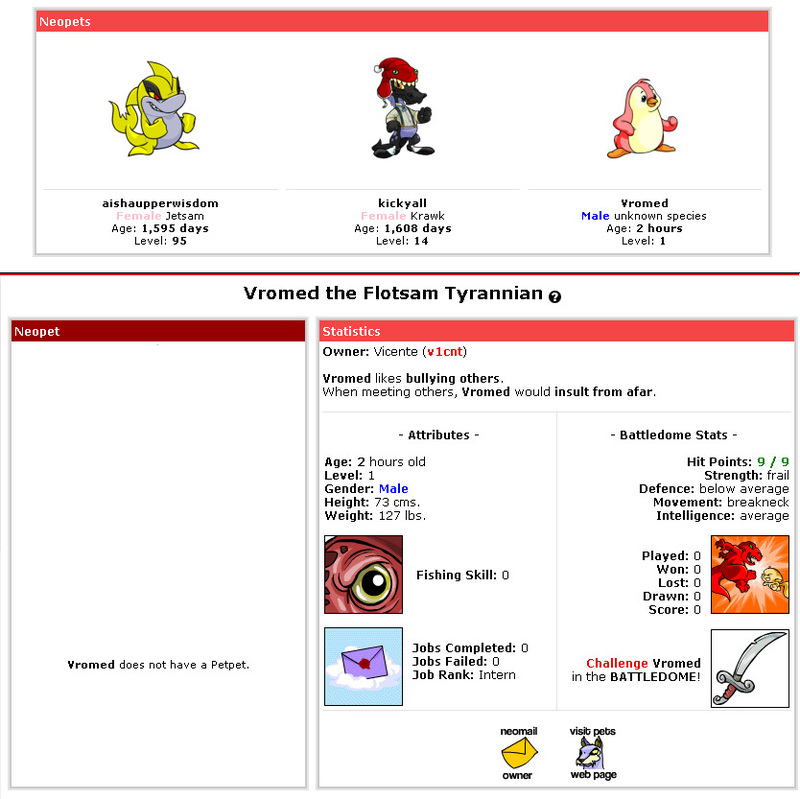 These pets were the result from a very old Grundo creation glitch which was assumed to be fixed long before the create-a-page revamp (detailed more in the negative-statted pets section), thus there is a very small number of these pets: since they are so old, it is very likely that many of them were purged through the various pet purges we've had, and thus only a small number remained. Because of their unique name, the site tends to have a bit of trouble handing links and displays relating to that specific pet, such as images; it is assumed to be more drastic for pets with spaces in their name rather than pets with other characters in their name, but it can be understandably very situational. As far as site issues, there are a couple. 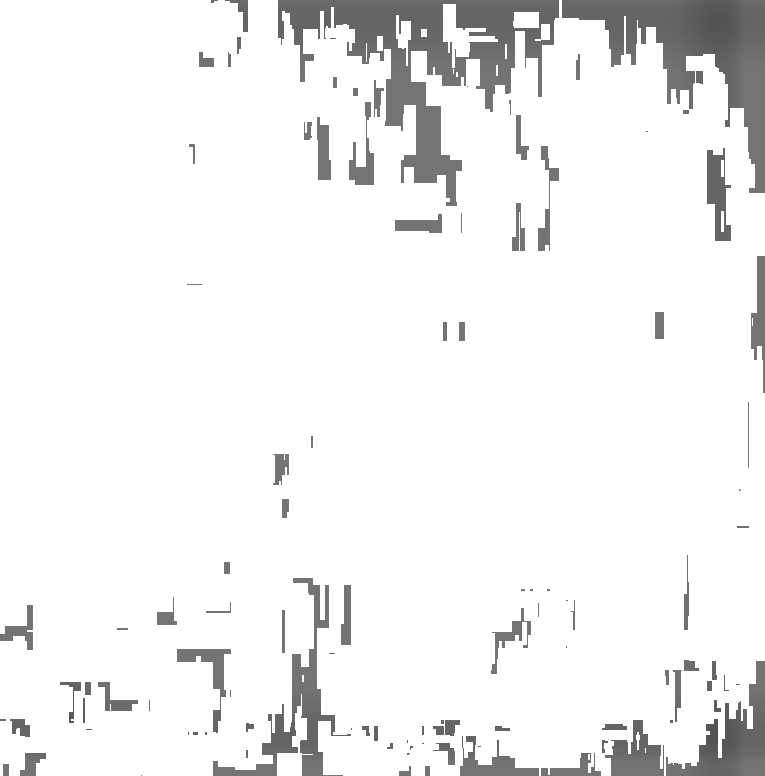 The biggest one is that he shows up as a broken image in several places, such as if I play with him, and on the 'give your neopet a description' page. When using HTML, it's no problem to link to him with the spaces, but when I had him in the BC and had his link in my sig, I had to put the %20 symbol where the spaces are or else the link would have simply stopped after the I in his name. However, most user edited content, such as links in petpages and userlookups, seem to handle the names fine. On the other hand, because the Neoboards automatically format links and cannot recognize the end of a pet name properly, a space (and possibly a few other characters) must be entered in manually via HTML codes for the Neoboard coding to recognize it as part of the link, such as to a Beauty Contest entry or petpage. TNT has recognized these pets and they have agreed to assist in the transfer of such pets if the need arises, since due to their unique name they cannot be transferred via the normal method (and it can be assumed that cannot be pounded/adopted smoothly either). Also, you're probably already aware that the pound doesn't work for pets like him and to transfer them, you apparently need to contact TNT and have them do it manually (I've never done it, so this is secondhand knowledge). 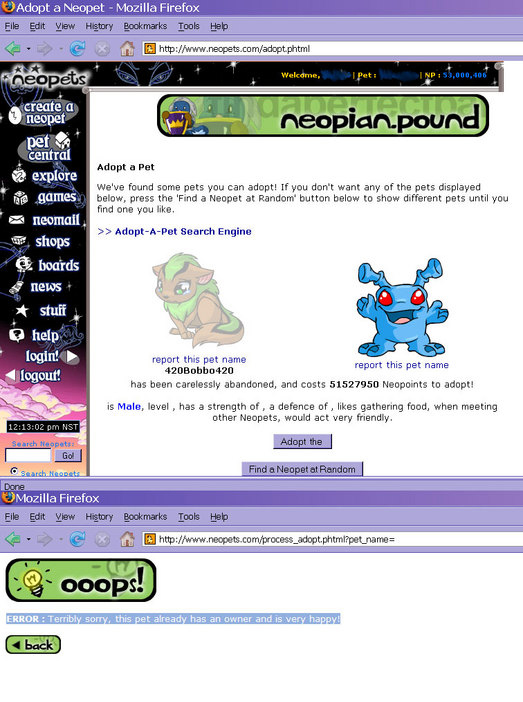 This screenshot depicts an adoption attempt for a pet with a space in its name in the old pound, accompanied by an absurdly high adoption fee (the strongest pets on Neopets don't even come close to the fee listed), assumed to be due to the pound's inability to handle the code from the name. In addition, even though the fee was met, the pet was not able to be adopted. Although the coding for the current pound differs from the time this screenie was taken, it is assumed that the invalid character will still cause some sort of breakdown. I also remember seeing a pet in the pound ages ago that had a dash in its name, but nobody could adopt it. I wish I could remember its name! On November 14, 2017, a pet with a space in its name, Goostoff Pierre, was found in the pound, but unable to be adopted. 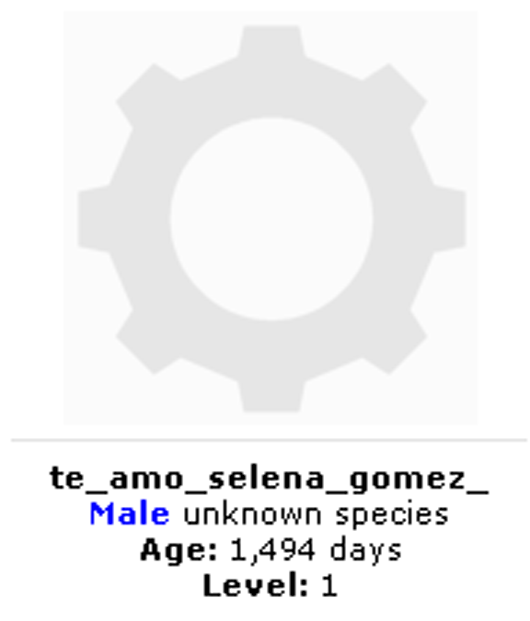 The age of the pet was estimated to be over 16 years old according to the (UC) petpet. Goostoff could not be searched in the pound's search bar but could be found by manually scouting through the pound, did not have an image show up, and gave the error that the "pet could not be found" when attempting to adopt. Dawn has kept a list of these special pets around the site, found here! A long time ago, according to TNT, Grundos were able to be created with spaces and special characters in their name, such as dashes, punctuation, etc. The fact that they were all created as Grundos is crucial because the Adopt-a-Grundo system used a slightly different creation code from the pet creation system at the time. Since it was such a long time ago, I don't have much detail on this specific process or when it was fixed, but it was assumed to be fixed pretty quickly. I saw a pet with spaces between his name! There is also a pet named ^-^, Why can't we put spaces and signs in our pets names anymore? Hi TNT! You said in editorial 240 that we can't add odd symbols or spaces to the names of petpets. And that a krawk petpet would only be interested in eating the fungus if his or her name is an acceptable Neopet name. Well, I came up seeing "cotton candy the Pink Krawk" (And yes! It has a space!) I wonder if it was just a glitch at that time or whatever. Could you just clear this up for me? Thank you. An over-aged petpet is identified by a pet being younger than its attached petpet. In other words, the petpet is older than the pet itself, which normally would not be possible since the petpet must be attached after the pet is created in any normal scenario. This type of pet-petpet combination is unique in the sense that it could have come about in two (known) completely different ways. Because petpets are not allowed to be considered as part of a trade, trading specifically for over-aged petpets are theoretically against the rules, to avoid users from profiting from selling the attached petpets. More detail can be found in various editorials such as this, this, this, this, and this... I think you get the idea. There are two ways this glitch can happen – one which involves the purge and some degree of luck, and the other which involves the old pet creation system. The first type is one that was recognized as TNT as a purge glitch, and happens on extremely rare cases. When such a case occurs, the pet will be created with the petpet that used to be attached to the purged pet of the same name. For example – all theoretical – Uncertainty the Yellow Lupe was purged from an account during the 2012 purge, and he and his Slorg were roughly 3000 days old when he becomes purged. I come along and create Uncertainty as a Red Acara, but find that Uncertainty the 0 hour old pet has a 3000 day old Slorg attached. This is because that Slorg was attached to the previous pet that held the same name. This is similar to the scenario where a petpage that is not the original, default petpage is found on a pet that was just recently created as a result of the purge. He was on the UC petpet guide from YEARS ago saying he had his petpet. Long before he was ever created. So we know he had to have gotten it from the name actually purging. 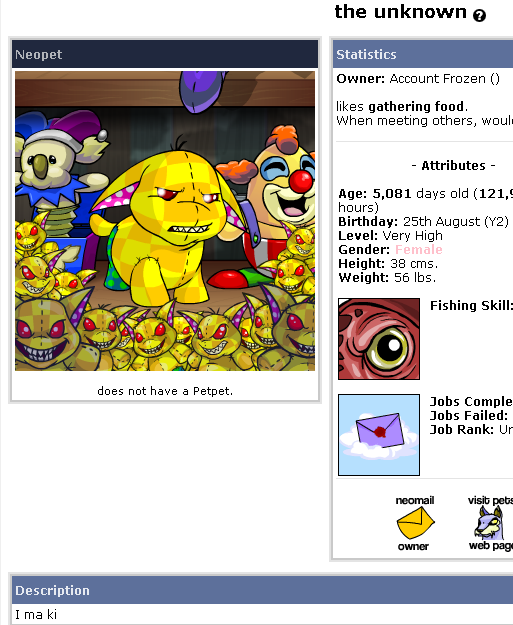 It also seems that having an over-aged petpet that came from the purge may cause some minor display glitches throughout the site (primarily on the quick ref page). However, these petpets can still participate in all of the usual petpet activities with little to no issues. On April 14, 2016, a new pet was created with a 5200-day old Angelpuss attached, indicating that this can still happen (albeit extremely rarely). The second type is a slightly more deliberate case, and involves the old pet creation system that involved several steps over several pages, instead of all steps compiled into one page. 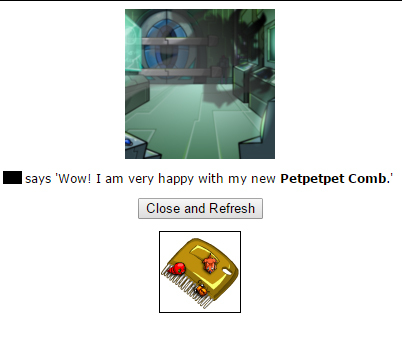 According to a user, a pet could have a petpet attached (and apparently painted as well) before they were actually "born", before their age counter officially began. Pets that have petpets that are much older than them most likely fall under the first category, while the petpets that are only a few days older are most likely in the second category. Below are some editorials describing the petpage glitch and the multi-step pet creation system. Um, TNT? I created a Cybunny and his Petpage is an EYRIE'S!!! I AM CONFUSED!!! Hey, TNT! I was wondering what the "not yet born" glitch is. I've seen quite a few Neopets whose ages are not yet born. What caused this issue, and will it ever be fixed? An item petpet is characterized as a petpet that is not normally considered a petpet, such as a plushie (not to be confused with a plushie-colored petpet) or a customization item. This is usually due to a coding oversight by TNT in which the programmers would assign a petpet flag to an item that is not a petpet; these items were found to only carry this glitch for a short time after they were released. Several items have been found to have been affected by this bug oversight throughout the years, and according to TNT, there was also a window where every item could be attached to the pet as a petpet, even though they were not flagged as petpets. Since they do not have alternate colors, item petpets cannot be painted at Petpet Puddle, but can participate in all other petpet-related features on the site, such as Petpet Battles, Grave Danger, and even zapped in the Petpet Lab, if you so wished to risk losing the item petpet. The petpet can be nicknamed and is generally treated like any other petpet, with the exception that they cannot be considered in the PPL, since it is not a legitimate petpet species. This may also bar them from being able to enter in the Petpet Spotlight. These petpets also do not respond to the "Say something to _" feature in the petpet page from quick ref. TNT also mentioned in an editorial that there were times where anything could be attached as a petpet: most likely, any other item petpet that are not one of the above are part of these "windows". A huge list of item petpets with their Neopet owners can be found here! It seems that TNT recognizes this glitch (according to various editorials) but do not mention anything about fixing the item petpets, however, they do not intend to qualify them for PPL. In addition, while they do not technically classify as glitch item petpets, there was a Neopets TCG-related "event" a long time ago (check the January 27th news, presumably happened on January 26th) that allowed certain petpet-related TCG cards to be attached to a pet, such as Puppyblew (TCG) and Warf (TCG). Hi, TNT. I was wondering if "glitched item" Petpets can win the PPL award, or do you not select those as winners if they're entered? 9/9/9 Draiks or simply 999 Draiks are Draiks that were accidentally released in the morning of Draik Day 2009. TNT has expressed that this was a result of a glitch, and that those Draiks were not meant to be creatable (Draiks were never able to be created via Create-a-Pet and must be hatched, morphed, or transmogrified). However, despite recognizing these Draiks as a result of a glitch, TNT has decided to let these Draiks go, and any trades involving them would simply be considered as regular trades; they also will not intervene if a user decides to offer "more" for a 999 Draik for whatever reason. 999 Draiks are probably one of the most widely known type of "glitch" pet, and one of two glitch pet types that have been openly recognized by TNT and determined completely safe to trade (although the other one requires TNT's direct assistance to transfer safely). The easiest way to verify if a Draik is indeed a 999 Draik is to check the height and weight. 999 Draiks themselves have a lower height and weight compared to regularly hatched Draiks, and are found to have around a 45 cm height and 85 lb. weight. A complete guide detailing on all the specifics of 999 Draiks can be found here. All details written below are taken from that guide. Around 2,200 Draiks were released to be creatable in that morning, according to /~Voldemoor. TNT soon caught onto it and fixed it soon after. Due to the large amount of Draiks that were released and the impact it made on the site's players, TNT decided to let them go, as removing them may possibly cause more drama. An editorial detailing on the 999 Draiks was found on the next issue, since it was a completely unexpected glitch that, contrary to much of the other glitch pets, became well-known news very quickly. Howdy, TNT! This is my first time submitting a question to the Editorial, so I'm a bit nervous! Anyway, it seems that on September 9th, 2009 at the hour of 6:00 AM (NST), Draiks were released for creation through "Create a Pet." This caused an obvious uproar within the Neopian community. My question is as follows: was the release of the Draiks an accident or intentional? A lot of people are wondering. Everyone has tried to come up with their own theories, but I'd love to have TNT explain the whole situation. 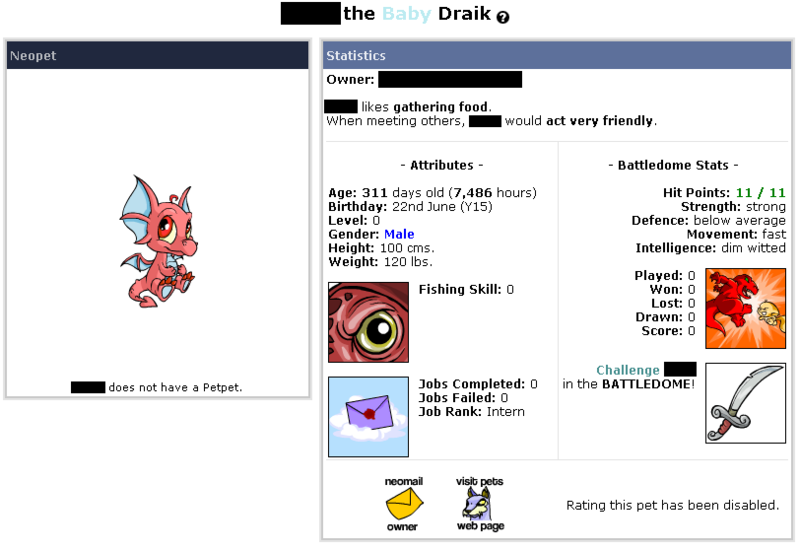 So, I've seen people trading Neopets on the boards of The Pound and they are attempting to trade their Draiks that were created on 9/9/09 for more expensive Neopets, etc. Would this be considered taking advantage of a glitch, since their posts state that these Neopets were glitched Neopets and that they should be getting better Neopets? Will Draiks be released again this year? CSS by Learning to Fly, edited by me, Tiffy. Background by Chronoraven, edited by me. Neopets images are credited to none other than Neopets.com. Negative level Ixi screenies provided by an anonymous user, used with permission. 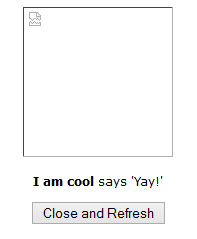 I am cool screenies provided by Ruse, used with permission. Vromed, negative-level zap and invalid character pet adoption screenies provided by Dawn, used with permission. Lunerre screenie provided by Naru, cropped from the full screenie here, used with permission. All other screenies are taken by myself. I want to thank all of the users that have contributed to the information on this page, such as verifying information, providing screenies and past experiences, and allowing me to use your pet as an example, but also those that helped me figure out theories behind certain pets (especially the negative-statted pets!) and led me to the names of various glitch pets around the site: I feel absolutely honored to be able to witness so many of these amazing pets!